For Daw Moe Moe, there’s no time to wait for the sun to rise before starting her day. Every morning, she’s up at 4 a.m. to cook breakfast for her family before taking the bus to the meat market, where she purchases fish and chicken to sell back at her shop. 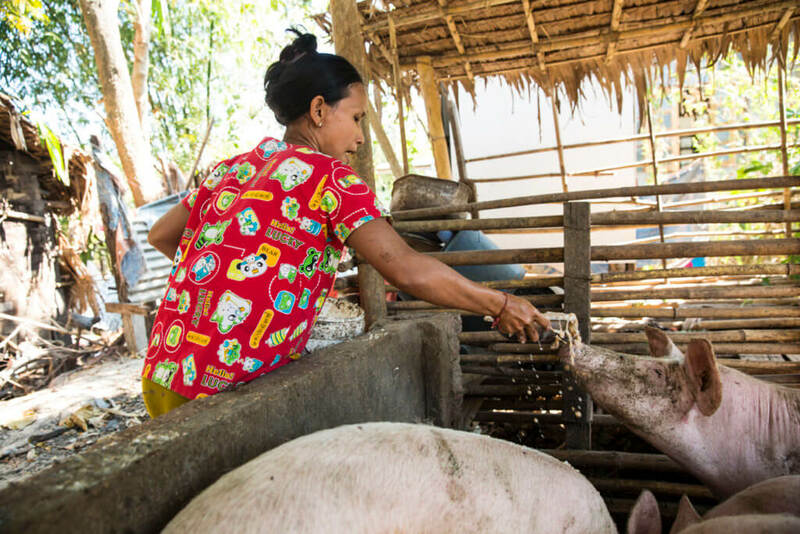 She raises pigs and runs a snack shop selling rice, sweet treats, and cooking oil in Hlegu Township, just north of Yangon, Myanmar´s former capital city. Her husband also works hard, earning 5,000 kyat (~US$ 3.30) per day driving a trishaw taxi. Despite her long days of work, Daw Moe Moe didn’t have enough money to replace the dirt floor in her shop with something more durable. That’s why she turned to Accion portfolio company DAWN. DAWN works across six regions of the country with small and medium business owners like Daw Moe Moe to make sure they have the tools they need to succeed. For many of these entrepreneurs, this is their first time interacting with a formal financial institution, so DAWN has to build trust with their customers. To this end, DAWN has focused efforts on creating strong relationships between its loan officers and mostly-women client base, and also providing educational support. DAWN’s relationship-building and client education efforts are part of its client-centered approach — an approach that has guided its transition from a program in a nonprofit organization, to one of the leading microfinance companies in Myanmar. When designing and testing new products and services, DAWN takes care to consider the impact on clients and makes changes based on what will result in a positive experience for its customers. DAWN is working on even more ways to improve the experience for their customers. The institution is currently in the process of implementing a digital field application (DFA). It will streamline processes and allow it to capture more accurate and useful data, and to track social performance and client satisfaction. Technology has replaced the piles of paper and notebooks DAWN previously used to track transactions. Paperwork that once took 4 hours now takes 20 minutes. This means spending less time at the branch, and more time supporting local women like Daw Moe Moe improve their businesses. Coupled with DAWN’s new partnership with Ongo, a leading mobile money service provider, cash management has become almost exclusively digitized. This makes work safer for DAWN’s employees, who no longer need to carry cash, and makes the loan repayment process more convenient for customers. While digitization has been a powerful force for helping drive financial inclusion in Myanmar, DAWN is also mindful that many customers are not fully comfortable with new technology and financial products. To make sure all of its clients are set up for success, DAWN requires its group lending borrowers to attend three basic financial education sessions. To further support its clients, DAWN expects to include additional educational elements to address the digital financial service literacy gap. There are more than 10 million people in Myanmar who don’t have the financial tools to support their families, manage their businesses, and seize opportunities to improve their lives. To chip away at this vast number, DAWN will continue to stay focused on what its customers need and grow to serve those who have been left behind for too long.